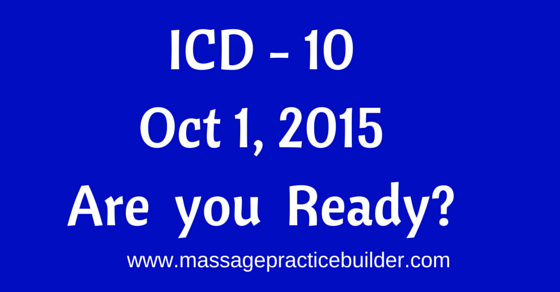 Yes ICD -10 codes are here and there is a lot of information that you will need to know. International Statistical Classification of Diseases and Related Health Problems codes are created by the World Health Organization and are used around the world. They are diagnosis codes that are used when doctors prescribe massage so you will need to be up on what is going on. We are currently using ICD-9 codes which were created 35 years ago and are really out of date. The ICD 10 codes were created in 1990 and all of the other countries who use the ICD coding system are already using them. The US is way behind on this one. The next version – ICD-11 are already on the way expected in 2017 or 2018. There was of course many controversies over this because changing the codes means that all the doctors and all of the computers need to be updated every time which is of course a major project. There was a lot of discussion saying that we should go right to ICD-11 but the rationale is that the ICD-10 is such a big change and is a foundation for the ICD-11’s. 7th digit is a special extension code that will be alphabetical and is required for injury codes that start with S.
D: Subsequent Encounter -After patient has received active treatment of the condition and is receiving routine care for the condition during the healing or recovery phase. Fractures have a different extension code than other conditions based on open vs. closed, routine vs delayed healing, non-union or malunion. 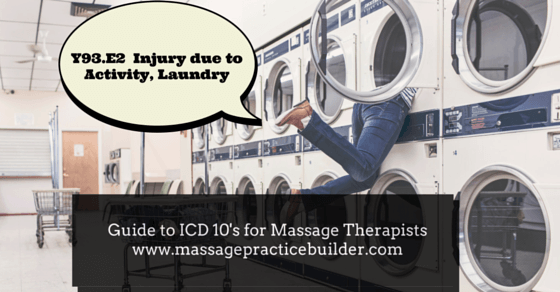 ICD-10 codes will provide specific locations for injuries. They will also document chronic or acute pain issues. The new codes are much more specific and will provide us with much more information about diseases and their treatments which will help with health management and research. Since these are diagnosis codes and massage therapists can not diagnose clients, the codes will come from the doctor. The doctor may or may not write the actual description of what the code means so you may have to look the code up to know what it means. There are many free code look up databases online. See ICD 10 Look up from CMS. Here also are some common orthopedic codes that are used for rehabilitation from Road to 10. As you can see, these codes are much more specific so that will give you so much more information. You can actually start using these now and you should actually start using them now. You can start by just using it on like 10% of your clients to test the systems. You will have to ask the doctors to start supplying the codes. The reason for starting with them now is because we don’t know how all of the billing and insurance systems will work with handling the new codes although there has been extensive testing. There could be delays in processing as everyone starts using the new codes. The ICD 10 codes are in effect now. To get massage covered by insurance is a whole other thing. You will need to work with the State’s Office of the insurance commissioner to get them to implement 2706 of the ACA and make them make insurance cover you. You will need lawyers, lobbyists etc. One was a 724.3 converted I used M54.30 (sciatica) but I see another one with Lumbago. Thanks for posting! Hi, I too am trying to get the new codes to use for my clients , my city in the state I’m licensed to do Massage Therapy covers their employees for a once a month massage. I don’t have the new codes. Looking for this and would appreciate any help in doing so. the doctor will give you the new codes. Call their office and have them update the script and put the new codes or just get the new codes. You can also convert the old ones using the ICD 10 converter linked in the article. Thank you, Julie, for putting this together. I have doctors prescriptions for MXX.X… (pain codes) and SXX.X… (injury codes). Your post helped me clarify these are ok. For the same patient, another doctor’s office wrote one uncoded prescription and another with codes that, from your article, don’t appear to be OK for massage treatment: F07.81 (post-concussion syndrome) and V43.52 (car driver injured in a collision) and R51 (headache). Yes we treat musculoskeletal dysfunction that might give rise to headaches, but this code doesn’t begin with M.
Will those three codes be rejected by the patient’s insurance? Should I ask the doctors to only prescribe by M and S codes? Or is that arrogant of me to ask from a doctor? I am billing under 97140, and mostly doing craniosacral and myofascial release work, with some Ortho-Bionomy. I Believe some Massage Therapist have surpassed many of the Physical Therapies out there and will not be recognized by the Medical field due to perception of a Generic word. I could go up against many Physical Therapist. Have Quicker and Better Results. But my work will not be recognized by Insurance companies. Orthopedic Massage and Medical Massageneed their own Codes. Actually professions do not have their own codes. A CPT code can be used by any profession that can use it depending on their scope of practice laws. Massage therapy is already being recognized by health insurance in WA State and has been for over 20 years. Using office ally to bill an MVA requires an ICD code, in Oregon patients can self-refer. If diagnosing ICD codes are beyond the scope of practice how does one submit a CMS 1500 form? Another instance is a doctor giving a report that says “whiplash” or “right shoulder pain” on it with no diagnostic code next to it, the only ICD code was not billable. Do we have the scope to extrapolate the codes from this?